This suman recipe, specifically Suman sa Lihiya is a popular treat in Antipolo. Right after a pilgrimage to the famous church, booths of different Kakanin will greet you outside. 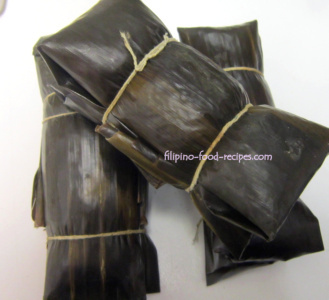 Suman sa Lihiya is made with sticky rice flavored with lye water, wrapped tightly in a banana leaf, and boiled for a couple hours. The recipe featured here was shared by a colleague, Celeni L. She made the suman from scratch and it tasted great and authentic so I want to share it with you. Just like kutsinta, lye water is not an optional ingredient for this recipe --as it's what gives the suman a distinct flavor, and obviously part of the name. The preparation is such an easy process, so the only challenge here is the long hours of cooking. If you see a recipe saying it takes an hour to two to cook boiling in water, that could not be realistic. I was told that it took 5 hours to cook a couple pounds of glutinous rice, but that's a yield of about 20 plus suman. If you are making a lot less than that, I suggest you test for doneness after 3 hours of cooking. 1 Wash the glutinous rice flour once, then soak in water. Make sure the rice is fully submerged. Set aside for 30 minutes. 2 Prepare the banana leaves for wrapping. 3 Strain the water thoroughly, then add the lye water. The rice should turn yellowish. 4 Measure 1/2 cup of rice and put on banana leaves. Fold all ends in tightly to make an approximately 3 x 1 1/2 inch pillow, set aside. 5 With the folded sides inwards, tie together 2 pieces, like pictured. 6 Set on a big pot and cover with water, bring to a boil and turn the heat down to simmer for at least 3 hours and check for doneness. 7 Open one pair and see if the suman is soft and fully cooked. If not, tie it back and return to boil. 8 Check every 1/2 hour or so for doneness. 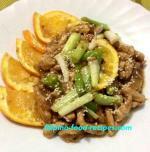 9 When done, serve with sugar mixed with grated coconut. Make sure the banana leaves have no rip or hole, otherwise the lye flavor will be washed out in the boiling water, and you're left with just sticky rice. 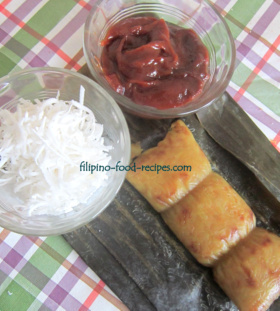 I made this suman recipe using a pressure cooker (for experimentation purposes and my mom wanted them). The result? It took an hour and a half to cook, but the banana leaves dried out and it looked unappetizing. The taste was pretty good but nothing beats the low and slow cooking method. Also, if you plan to use a pressure cooker, check your cooker's manual for safety precautions -- as it's not for everyone.